Biologist Dr. Helen May-Simera is the recipient of a Sofja Kovalevskaja Award from the Alexander von Humboldt Foundation. She will use this to set up a junior research group at Johannes Gutenberg University Mainz (JGU) that will investigate the causes of eye disorders that are associated with cilia dysfunction. Prior to receiving the award, May-Simera was working at the National Eye Institute (NEI), an institute at the American National Institutes of Health (NIH). In Mainz, she will be heading up her own research group of young scientists in the Institute for Zoology, thus further enhancing the focus set on the molecular biology of cilia and the related disorders. At Mainz University, May-Simera will also have access to the existing expertise and the national and European networks maintained by the Mainz researchers. Over the next five years, the junior researcher will receive prize money totaling EUR 1.65 million designed to finance her research project. The Sofja Kovalevskaja Award is financed by the Federal Ministry of Education and Research (BMBF) and is awarded by the Alexander von Humboldt Foundation. It is one of the most highly endowed German academic prizes and is used to promote the work of outstanding junior researchers under unique conditions. For five years they can undertake their own research project and form a working group at an institution of their choice in Germany – independently and without administrative constraints. The award is used to honor the outstanding academic achievements of exceptionally promising young scholars from abroad. This year, a total of eleven young academics received the award. The application submitted by Helen May-Simera to the Humboldt Foundation covers a research project in which she intends to investigate signal processing in the retinal pigment epithelium, a layer of the retina. The main aim is to discover the extent to which cilia play a role in the transmission of signals. Primary cilia first became the focus of research in the early 1990s once their versatile functions had been identified. Cilia are small organelles that project out from the cell surface and act like antennae; they receive signals from the environment, process them, and pass them on into the interior of the cell. Primary cilia dysfunction can have serious consequences for health resulting in so-called ciliopathy syndromes. These include Usher syndrome, neurological disorders, cystic kidney diseases, and the complex Bardet-Biedl syndrome – the latter being the specific interest of May-Simera. At Mainz University, Professor Uwe Wolfrum, May-Simera’s scientific host, has been conducting extensive research into cilia and ciliopathies for the past several years. 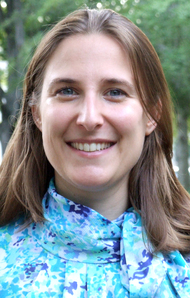 "We are very pleased that Dr. Helen May-Simera will be continuing her research here in Mainz and I am convinced that her work will represent an exceptionally valuable contribution to our ongoing and planned research projects and that there will be mutual benefits," said the cell biologist. The research focus on the molecular biology of cilia and ciliopathies is promoted within Wolfrum’s work group by projects such as those of the European 7th Framework Program for Research and Technological Development and the German Research Foundation, in various foundation projects, and a European E-Rare Joint Project. In addition, the transnational work in Mainz is also integrated within the Research Unit Translational Neurosciences. Additional research projects are currently under evaluation.